PolicyInteractive recently conducted a national survey of 418 individuals, which included 152 Trump-voters and 204 Clinton-voters. 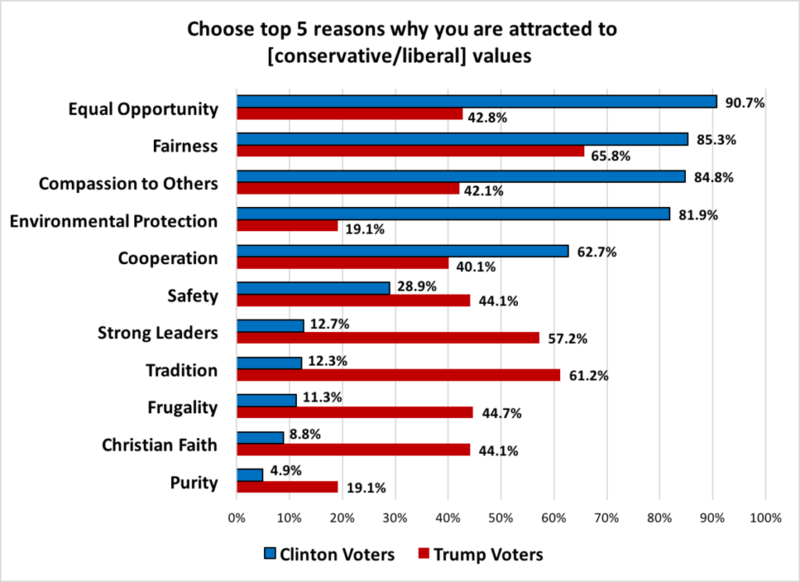 When asked to choose 5 (out of 11) reasons why they are attracted to either conservative or liberal values, five characteristics clearly emerged for those who voted for Clinton, while Trump voters were more diverse in their responses (see bar chart below). These results align with research conducted by Graham, Haidt, and Nosek at the University of Virginia (2009). Using what are considered 5 sets of “moral intuitions,” which include Harm/care, Fairness/reciprocity, Ingroup/loyalty, Authority/respect, and Purity/sanctity (Haidt and Graham, 2007), their 2009 study found that liberals seem to focus their support on Harm/care and Fairness/reciprocity, while conservatives value all 5 concepts more equally (Graham et al., 2009). We look forward to our upcoming survey, where we will explore what some of these terms mean to those with seemingly opposing ideological world views. For example, does “fairness” mean the same thing to liberals and conservatives and what language can be used to make “environmental protection” a more bipartisan value? 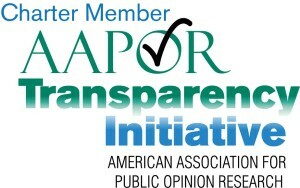 Surveys were collected via opt-in online survey among a nonprobability sample of Americans from the general public (418 participants, with 152 having voted for Trump and 204 having voted for Clinton in the 2016 election), all survey workers from Mechanical Turk (MTurk). This study was sponsored, conducted, and funded by PolicyInteractive. MTurk respondents were paid a token of $1.12 each. The reported data is not weighted. These surveys were administered during the month of July in 2017, and only in English. Demographic details, complete surveys and full results at links below. *MTurk workers tend to be younger, more formally educated, more White, and more liberal than the general public, which is of course important to keep in mind while reading over the results. Haidt, J., & Graham, J. (2007). When morality opposes justice: Conservatives have moral intuitions that liberals may not recognize. Social Justice Research, 20, 98-116. Graham, J., Haidt, J., & Nosek, B. A. (2009). Liberals and conservatives rely on different sets of moral foundations. Journal of personality and social psychology, 96, 1029.